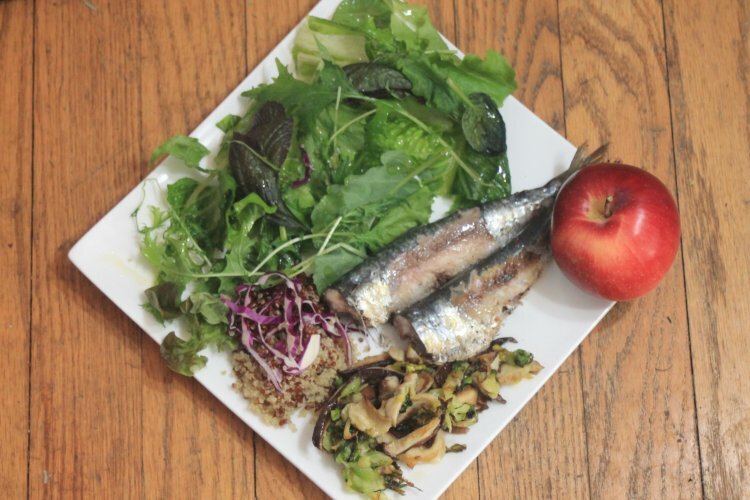 This is a meal with sardines, a Brussels sprouts/shiitake stir fry, and some greens with quinoa. Get your fishmonger to scale them, although I am given to understand that the large scales are really quite thin and edible — but I don’t really want to eat them. You can have him gut and clean the fish, too. If you do it yourself — this is probably one of the few fish I’d scale indoors, in my kitchen, as the large scales (way out of proportion to the size of the fish!) are easy to find before they dry out and adhere to any neighboring surfaces within two yards, like other fish scales. Use a paring knife and run it backwards from tail to head. You can also buy a dedicated fish de-scaler; you may have to look on-line. Now, I’m no stranger to finding yummy meat in fish heads, but, frankly, there’s nothing there to find on a sardine, so I cut them off, taking the lateral gill fins with it. Using a pair of kitchen scissors (if your paring knife is super sharp, you can use that, as well), I cut the belly from neck to vent, pull out all the guts and dispose of them, rinse thoroughly, and then look inside. If there is any dark brownish stuff, I scrape it out, gently. This gets rid of all bitterness. Rinse again, pat dry, and reserve. This is one meal where you want to get everything in place before you turn on the range. Greens, a mixture. You can optionally add in cuke, baby (salad) turnips, shallot, as you wish. Extra virgin olive oil. 1/8 cup. Apple cider vinegar. 1/8 cup. Prepared white and/or red quinoa, about 1/4-1/3 cup. More if you want. Lemon pepper and garlic powder to taste. No salt needed, it’s a salt water fish and comes with its own. Arrange the salad ingredients and the chilled quinoa on your serving plate. Mix the oil, vinegar and optional herbs together. You will have to shake or mix these again just before serving, as there is nothing here to keep the oil and vinegar from retreating from each other. Saute the Brussels sprouts in a large hot skillet (medium high) with the oil until they just start getting a hint of brown, stirring often. Add in the shiitake and seasonings, and continue stirring for a minute. Put the sardines (patted dry) into the skillet on the far side of the veggies, along with its seasonings, also in a little oil. Cook for a minute, then flip them and reduce heat to medium low. Stir veggies again. I cover with a screen. The fish should cook at least three minutes on that side before you flip them again — remove veggies now if they look ready — roasted appearance to the sprouts and semi-translucent appearance to the shrooms. If not, move them around a bit on their side of the skillet. Cook the sardines for another three minutes on this side, and if the fish is beginning to flake on both sides, you are ready to serve. Plate everything. Splash the re-mixed oil and vinegar over the greens, quinoa, the cooked veggies, and, should you wish, the fish. And enjoy. Fresh sardines should not taste “fishy”, although if your idea of an optimal fish is something like flounder, it will have flavor. It should not be bitter, either, if you have checked your (or your fishmonger’s) initial preparations. To Eat a Fresh Sardine: YES, there are a lot of tiny little bones in there. They are edible, cooked. I remove the backbone and the upper fin, but all those little fish ribs are good sources for dietary calcium. The tail at this point should be crunchy, and is thus edible as well. Nutrition Notes: The sardine is a fascinating little fish, usually found wild-caught, and filled with healthy Omega-3’s and dietary calcium, as well as being a great source of necessary protein. It is a sustainable fish, and very prolific in its breeding habit. As it is so small, and low in the oceanic food chain, that it is not a mercury accumulator and, so long as it is fished in clean waters, should have a minimal if any toxin burden. This entry was posted in Cooking, Mushrooms, Nutrition, Seafood and tagged Brussels Sprouts, Greens, Quinoa, Sardines, Shiitake. Bookmark the permalink.